Last Sunday was the last day of winter and before I retire my slowcooker I decided to make one last slow cooker dinner. I have been eating a lot healthier lately since I bought my fitbit and usually the food you make in the slowcooker isn't the healthiest leanest food to eat. A massive advantage of the slowcooker is that you can use cheap cuts of meat and the longer you cook them, the more tender and juicier they are. However, you do need to have meat with some fat on it, because otherwise it will get dry and chewy. After many slowcooker experiments I found that the best way to make the slowcooker work is to cut off some of the fat of the meat (also depends on what type of meat you are using) - cook it slow for 8 hours and then take out most of the juices, cool them down, scoop of the fat, return to the pan, add fresh seasoning and reduce the liquid before you bring it back to the slowcooker. For me this is a winning method to get fresh flavours in your meal. 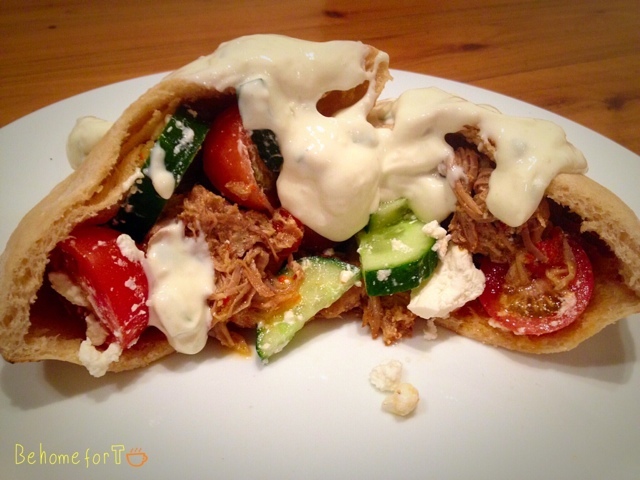 This Easy Traditional Greek Gyros recipe is from Half Baked Harvest. I have slightly amended the recipe and have prepared the meat (pork in this instance) as per the method outlined above. Winner winner pork dinner! The salad with cucumber, tomatoes and fetta brings some freshness to the dish. Working in a busy full-time job, I prefer to buy packaged bread and tzatziki instead of making them from scratch, but if you have the time I would highly recommend doing so! 1. Spray a crockpot with cooking spray. Add the onions and garlic. 2. In a small bowl combine the Greek herbs, paprika and salt and pepper. Sprinkle the pork with half of the spice mixture. 3. Heat a large skillet over medium-high heat and add a drizzle of olive oil. Once hot, add the pork and sear on all sides until golden brown (about 2 minutes per side). Try and get a really good caramelization on the meat. 4. Add pork to the prepared crockpot and sprinkle with the remaining seasonings and any drippings from the pan. To the crockpot add the, lemon juice, red wine vinegar, greek yogurt. Cover and cook on low, 8 hours. or high for 4-6 hours. If possible check the pork a few times during cooking. If needed add some water to keep the meat moist. 5. After 8 hours (or 4-6 on high) remove the pork and set aside to cool slightly. Once cool enough to touch shred the pork with two forks, it should fall apart easily. 6. Take the liquid out of the crockpot and put in a pan to cool down. After a few minutes, scoop off the fat. Heat liquid and add some more of the greek herbs, salt and pepper. Cool down and add some yoghurt. Return to the crockpot and stir through the pork. 7. Heat pitas (I just popped them in the microwave for a few seconds). Top with tzatziki sauce, sliced tomatoes, cucumber and feta cheese. Serve immediately.